Home » Microsoft » Internet Explorer » IE8: Simple Solution for: Cannot open an anonymous level security token. IE8: Simple Solution for: Cannot open an anonymous level security token. 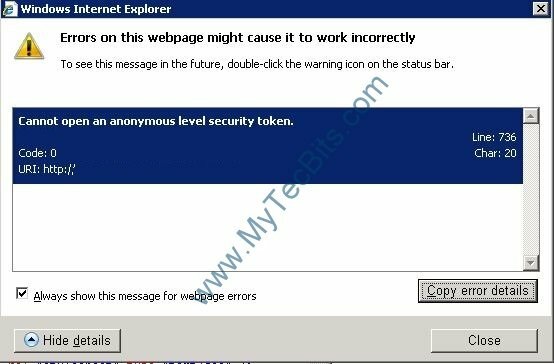 IE8 Error: Cannot open an anonymous level security token. On searching the web for solution, I found several forums recommending to change the DCOM Default Authentication Level to Connect. For a computer savvy person, this solution will be good. But for a common person, changing the settings on DCOM will be difficult and sometimes risky. On investigating further, I found a simple solution. I’m providing both the simple and the best solution you. The simple solution for this error is to set the IE8 to open the pop-up window, always in a new tab. Follow the below steps to do the settings. In Internet Explorer 8, go to Tools and select Internet Options. 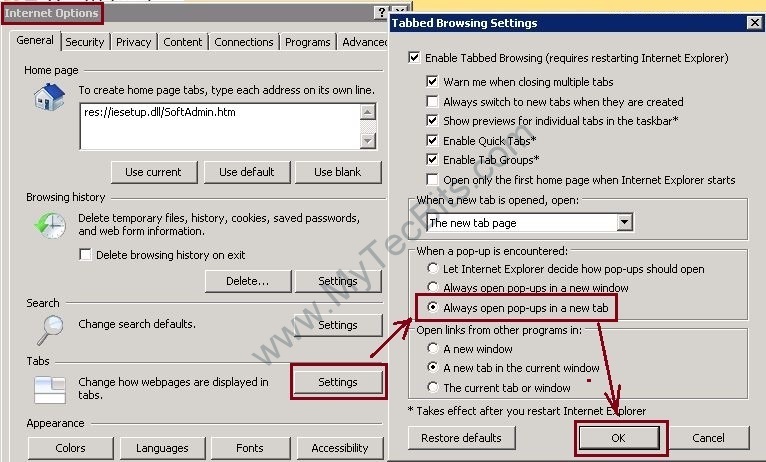 In the Tabbed Browsing Settings screen, under the When a pop-up is encountered section, select Always open pop-up in a new tab. If you have multiple logins in the computer, then the above step has to be repeated in each login. If you want to avoid doing this on each log in, then try the other solution given below. Type in dcomcnfg and hit enter. The Component Services window will open. In the Component Services window, expand the Component Services. Expand Computers. You will see My Computers. Right click My Computers and select Properties. In the properties window, go to Default Properties tab. Change the default authentication to Connect. make sure the default impersonation level is Identify. Click Yes in the confirmation message box. Restart the internet explorer and load the web page again. Simple solution worked for me. The ‘Best Solution’ worked great for my client. The Simple did not work at all. If you are unsuccessful with the simple, use the other method.